Chicago Drywall Workers, tapers, sanders, ceiling tile installers, and sheet rockers work in hazardous conditions and are exposed to toxic substances. According to the CDC (Centers for Disease Control and Prevention), a drywaller’s work environment is often filled with high concentrations of dangerous toxic dust that include respirable silica, calcite, gypsum, mica, silica, and talc. Some of these toxic compounds can cause significant irritation to the respiratory system, eyes, nose, and throat. The more time the drywaller spends in this environment, breathing in toxic dust, the worker can develop severe airway irritation and other problematic conditions including excessive coughing, breathing difficulty, and the production of phlegm. In drywall repair or replacement, the sheetrock installer might be exposed to cancer-causing asbestos fibers that become airborne during demolition. If you or a family member was injured while working as a drywall repairman you are likely entitled to workers compensation benefits. Contact the workers compensation attorneys at Rosenfeld Injury Lawyers LLC for more information and a free review of your legal rights and options. Use an electric or hand pole sander to smooth patched holes, corners, edges and joints to a seamless finish. In the Chicago area, installers are referred to as hangers or framers, and tapers are called finishers. In some incidences, a contractor may refer to a ceiling tile installer as an acoustical carpenter when the tiles installed on the ceiling are adhered to rafter material to block sound. The Heavy Weight – Based on the dimension, composition, and thickness of the material, a single sheet of drywall weighs between 60 and 120 pounds. While holding a single sheet against the wall or up to the ceiling rafters might be easily accomplished, repeatedly lifting heavy material can place a substantial burden on the worker’s body, back and shoulders that in time can cause serious problems. Pole Sanding – Once the drywall has been attached to the wall or ceiling, tapers apply a paper or mesh tape to the joints and corners, using a joint compound material as an adhesive and filler. However, studies by OSHA (Occupational Safety and Health Administration) and the Bureau of Labor suggest that drywallers and other construction employees exposed to the synthetic dust can inhale toxic chemicals, particles, and particulates that can be extremely harmful and cause significant problems including asthma and lung cancer. If these conditions are not accurately diagnosed in time, the problem can advance to a life-threatening state leading to a poor prognosis. Non-Protective Clothing – To minimize the potential of injury at the construction site, the drywall worker should consider wearing highly protective clothing that includes safety shoe footwear, a hard hat, and gloves, along with a respirator when sanding dried and hardened joint compound. Carpal Tunnel Syndrome (CTS) – Many drywall workers, sanders, and tapers develop CTS due to the repetitive motions of holding tools, grasping materials tightly, bending the wrist, or constantly pressing the wrist, lower arm and hand against hard objects. Traditionally, symptoms associated with CTS include tingling, numbness, pain, and burning sensation. Severe cases of carpal tunnel syndrome result in hand clumsiness, a shiny, dried palm, and muscle “wasting" at the base of the worker’s dominant thumb. Degenerative Disc Disease – Repetitively lifting excessively heavy materials and objects can denigrate spinal discs (the gel-filled cushions between spinal bones (vertebrae)). Over time, the disease will lead to numbness in the back and extremities, overall weakness and pain in the back, hips, legs, upper back, and arms. Lower Back Pain – Repeatedly lifting heavy materials, vibrating the whole body, making sudden movements, constantly twisting and lifting, and bending for extended periods can all lead to debilitating lower back pain. Tendinitis – The Repetitive movement of a hand, wrist, elbow, shoulder, hip, knee or ankle joint can lead to tendinitis leading to soreness and inflammation. The repetitive motion might include a hand twisting motion, rotating motions, finger triggering or lifting and body twisting. Finger Disease – Often referred to as Raynaud’s Syndrome, White Finger Disease can develop through the repetitive use of vibrating hand tools including saws, screw guns, sanders, and others. Common symptoms associated with this disease include tingling and numbness in the fingers (exacerbated by chilly weather), pale white fingers that turn red or blue, an overall grip weakness and numbness that debilitates the hand from working. Thoracic Outlet Syndrome – This condition affects the arm and shoulder when blood flow is reduced by carrying excessively heavy items or working overhead. Drywaller workers, sheet rockers, tapers, sanders, and ceiling tile installers often face various musculoskeletal injuries that include broken bones, joint pain, aching muscles, sprains, strains, and other construction site related injuries. Because drywall hangers, sanders and tapers work with building materials on different surfaces areas (ceilings and walls), they often suffer the worst types of injuries. 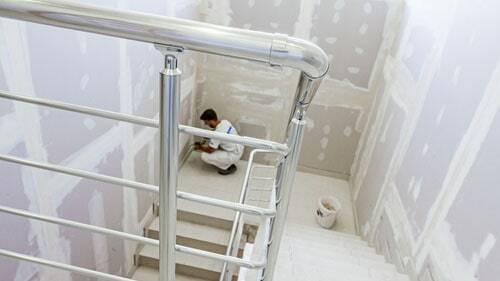 These problems occur because the worker is performing duties overhead which can exacerbate neck and shoulder issues and on walls using vibrating hand tools for sanding. Most workers in the drywall industry perform some of their duties at significant heights that increase the risks of being injured from falling. Repetitive Work – Workers in the sheetrock industry consistently push, pull, slide, tug, reach, twist, and work in a static posture (a singular position). Each one of these positions and actions can place a significant strain on the worker’s lower back and irritate the joints, tendons, and muscles. Awkward Body Posture – Working in awkward positions involving bending, lifting, stretching, crouching, and leaning backward, can put significant pressure on muscles, tendons, ligaments, and joints that cause irreversible damage. Muscle Forcefulness – The stress of completing the job tends to make workers perform duties beyond their capacity. The stress produced by a muscle forcefulness can affect every worker including those that are physically fit with strong muscles. The problem arises because the spine remains unprotected and susceptible to injury when the drywall worker lifts objects beyond the spine’s limitations or capacity. Constant Muscle Effort – Lifting and holding heavy objects in place until secured can cause significant injury and stress on the spine, muscles, joints, ligaments, and bones. Big, bulky, heavy materials carried in a vertical or horizontal position can cause significant fatigue to localized muscles or overall [whole body] exertion fatigue. Hand Tool Vibration – Drywall installers and sanders are susceptible to whole body vibration injuries that can produce cumulative trauma (slowly over time) to the nerves and spinal column that could produce permanent (irreversible) damage. External Stress – Workers are susceptible to substantial damage from external stress factors including working with sharp objects and dangerous tools. Some drywalling contractors prefer that their workers “wet sand" seams, joints, corners and edges instead of waiting for the joint compound to dry and hardened. Dry sanding can avoid damage to interior furnishings and equipment and reduce a worker’s exposure to toxic substances that become airborne during dry sanding. However, many workers fail to wear respiratory protection, and when it is worn, it is often ill-fitted on the worker’s face. Many panels of drywall installed between 2001 and 2009 in Chicago were defective and now pose a significant health hazard to workers who installed the material and individuals living near it. In 2014, the CDC (Centers for Disease Control and Prevention) released the results of a study that linked to serious health issues to Chinese drywall. However, the results were no surprise to many homeowners who had experienced significant throat irritation, nose and eye problems, and respiratory issues. It was during this time that millions of commercial and residential properties, including mobile homes and trailers nationwide, had been constructed with Chinese drywall. While the material costs are significantly less than competing North American brands, it posed serious safety and health issues. In addition to manufacturing sheetrock using typical product materials like gypsum, the Chinese drywall manufacturers laced the material with dangerous chemicals including excessive levels of hydrogen sulfide, a serious poison known to kill. If a worker is confused whether the sheetrock is extremely toxic, they should check the back of the drywall panel that may or may not be stamped with “Knauf Tianjin" or “Made in China." Case 1: Baton Rouge, Louisiana – An employee was killed in a crushing injury accident involving falling material. During the late morning hours on February 21, 2017, the worker used a forklift to transport gypsum board (drywall/sheetrock). The accident occurred while adding the bundled material onto a second stack. Due to a lack of safety precautions, the material fell from above and crushed the worker to death. Case 2: Watsonville California – During the late morning hours of May 16, 2017, a worker was muddying, taping, and smoothing sheetrock while standing on a rolling scaffold. Due to unanticipated movement, the worker fell from the scaffold and suffered severe injury. The worker’s injuries were diagnosed as epidural hematoma and hemorrhagic stroke that eventually led to his death. In nearly every case, injuries occurring in a drywall installation work environment can be traced back to exposure to harmful substances and repetitive body movements that develop musculoskeletal disorders. The physical nature of installing and finishing drywall materials is known to cause various complaints involving knee, shoulder, back, hip, neck and spine problems. However, most dangerous conditions on a construction site can be prevented if the worker can reduce many of daily repetitive activities required by their occupation to lift heavy objects, make awkward movements, and be exposed to toxic chemicals. An effective safety program can ensure good health over a lifetime. To develop a safe work environment, the foreman, supervisor, manager, or business owner should take effective steps to ensure that every employee receives proper training to increase their awareness of what to do. The first step is to identify dangerous hazards on the job site so that every employee remains consistently aware of potential problems that are easily identifiable with training. Once a problem is identified, it can be targeted. Once targeted, workers can make changes to avoid musculoskeletal disorder hazards and exposure to serious toxic chemicals, particles, and particulates. Each training exercise should reach the drywall worker through the foreman and the supervisor to ensure everyone understands the problems at every level. Seeking Financial Compensation to Recover Damages? 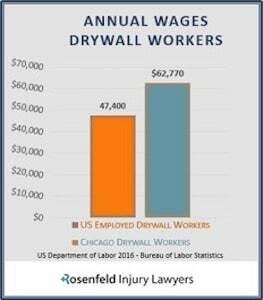 The Chicago Work Accident Injury Attorneys at Rosenfeld Injury Lawyers represent workers in the drywall industry. If you have suffered injuries or develop an illness due to a work-related problem, we are here to help. Our law office working on your behalf can investigate your claim for compensation and assist you in filing for benefits. Also, our attorneys will review your case to help you determine if additional parties might also be at fault for causing your damages. We use the complexities of civil tort law to benefit your and ensure that you receive all the monetary compensation you deserve to recover from your harm completely. Our law offices never require you to make any upfront payment to receive immediate legal services. Our arrangement postpones payment of all legal fees until after we have won your case at trial or negotiated an out of court settlement on your behalf. Be assured; if we do not win your case, you owe us nothing! Call us today at (888) 424-5757 now to schedule an appointment to speak with one of our attorneys on how to successfully resolve of your case for the highest monetary recovery possible.